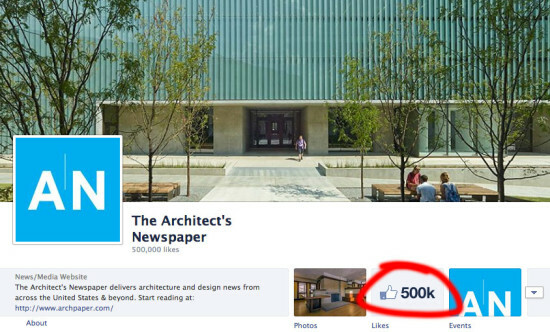 Earlier this afternoon, The Architect’s Newspaper gained our 500,000th Facebook friend, a major milestone in our growth. For an independently owned publication that started as a local print tabloid, the expansion of our readership in print, online, and through social media in the United States and around the world has been thrilling to watch. We’re so grateful for your support. But more importantly, we are happy to be a part of increasing the public’s awareness of architecture, design, planning, urbanism, and landscape architecture. That’s what keeps us working so hard every day. For those of you who can’t get enough AN, consider following and sharing us on social media: Facebook, Tumblr, and Twitter. Thanks again for your interest and support!